Soak 12 bamboo skewers in cold water for 10 minutes. Skewer beef and onion on skewers. Spray with oil; season. Heat a char-grill pan over oderately high heat. Cook and turn skewers for 5 minutes or until cooked. Meanwhile, place curry paste in a medium saucepan over low heat. Cook and stir for 1 minute. Add coconut cream, sugar and soy sauce; simmer for 2 minutes or until thickened slightly. 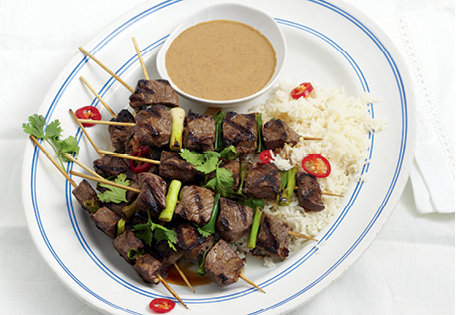 Top skewers with chilli and coriander. Serve with rice and sauce.